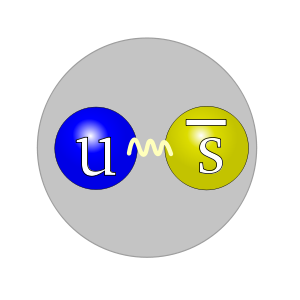 Kaons are a specific type of meson (mesons are particles made of one quark and one antiquark). What makes kaons unique is that they are made of one up quark or down quark, and one strange quark. (One of the two quarks that make of a kaon must be an antiquark, and the other must be normal matter. For example, a kaon can be made of one up quark and an strange antiquark). The discovery of kaons was significant because it proved the existence of yet another flavour (type) of quark, the strange quark. There are four types of kaons, but two of them are relatively easy to understand. There is the K+ and the K0. The + and 0 above the letter K refer to whether the charge is positive, or 0 (neutral). The K+ is made of one up quark, and one strange antiquark. Since antiparticles have the opposite charge of their counterpart (and since normal strange quarks have a charge of -1/3), 2/3 + 1/3 = a +1 charge, or simply a + charge. (Also because antiparticles have the opposite charge of their counterpart, if you change the up quark in a K+ to an up antiquark and the strange antiquark to a normal strange quark, you get the opposite charge, forming a K–). Since down quarks and strange quarks have the same charge, if either one of them is an antiparticle, the overall charge is zero. Therefore, a K0 can either be made of one down quark and strange antiquark, or one down antiquark and one normal strange quark. This page was last changed on 14 December 2015, at 06:30.